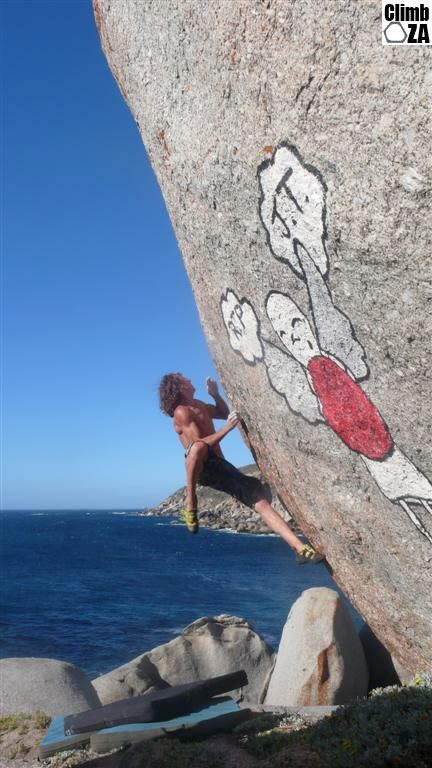 Llandudno is best known for it short desperate slab climbing above dodgy bolts from the 80’s. 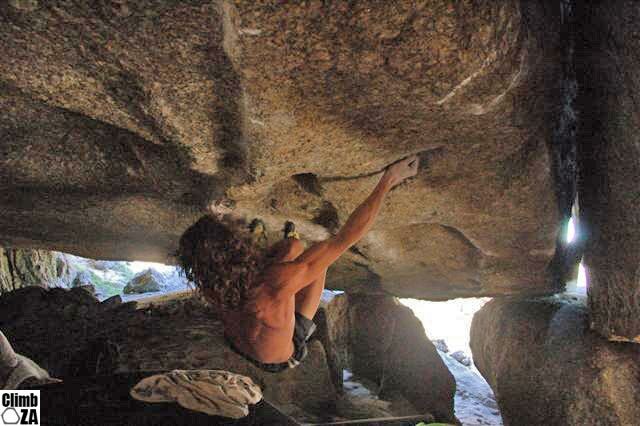 But more recently it is being frequented by a new generation of climbers looking for new urban bouldering areas. If nothing else it’s a sweet spot to chill with your buddies after a good training session and watch the sun go down over the sea. 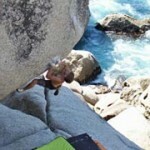 Llandudno Bouldering is 8 km from the centre of Cape Town and approached by one of the most scenic drives, over Suikerbossie Hill from Hout Bay or in the other direction from Camps Bay, along Victoria Road, Llandudno lies nestled in a private and peaceful cove with one of the most secluded and beautiful beaches in the city. 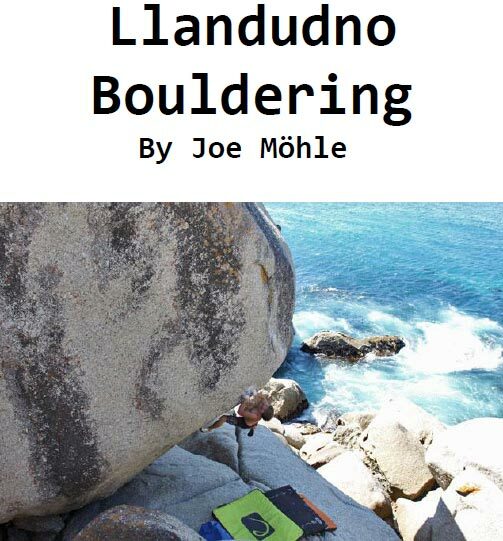 For the past eight years I have been very active at Llandudno and know most of the bouldering achievements that have occurred in that time. 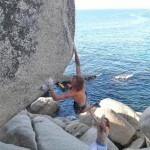 Prior to this Llandudno predominantly saw sport climbing development. All the routes on the American Dream Wall have now been bouldered. 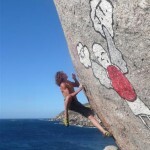 Recently, some climbers have seen fit to take Llandudno Bouldering twenty years back by bolting some highballs on the Guardian Angel boulder (including the Guardian Angel Project). Whilst I respect their decision to do so, I disagree with this method wholeheartedly. 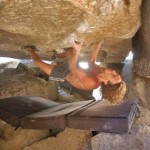 Highballing is an important part of bouldering and in other parts of the world (e.g. 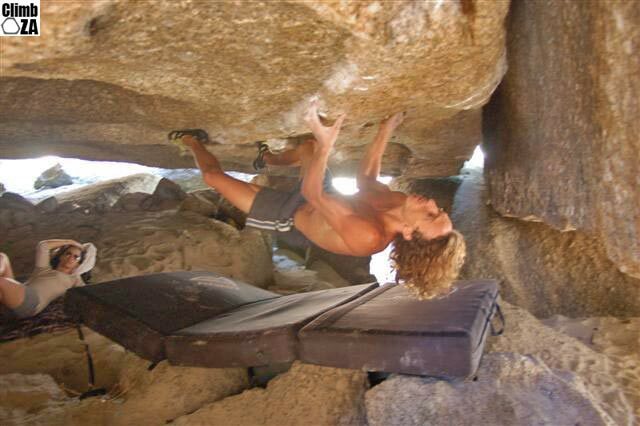 Bishop, CA) climbers are pushing the limits of the sport by climbing boulders that would dwarf the Guardian Angel boulder. 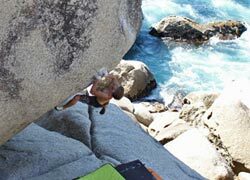 If hitting the deck frightens you, then bring more pads or stay in the gym, but please don’t stagnate the progression of our sport and scar these beautiful boulders with bolts. It is important to think out of the box at Llandudno and not get caught up in the “no more problems, all too easy or too hard” mindset. There are undoubtedly many more classics waiting for those with the imagination to express themselves through the climbing here. 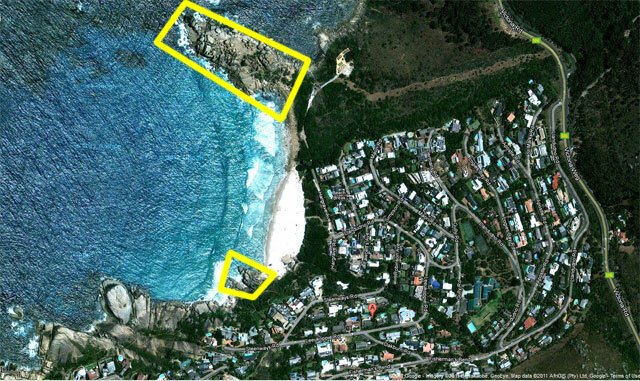 The area is divided into two sectors, split by an obvious clearing in the centre of the headland. The biggest boulder is “the egg” and serves as a good point of orientation (still unclimbed). 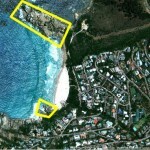 Llandudno boasts over one hundred documented problems and counting. Only the headland situated on the right hand side of the beach (facing the ocean) is documented here (there is also good bouldering on the left hand side of the beach). I have tried my best to credit the actual first ascentionists as accurately as possible. 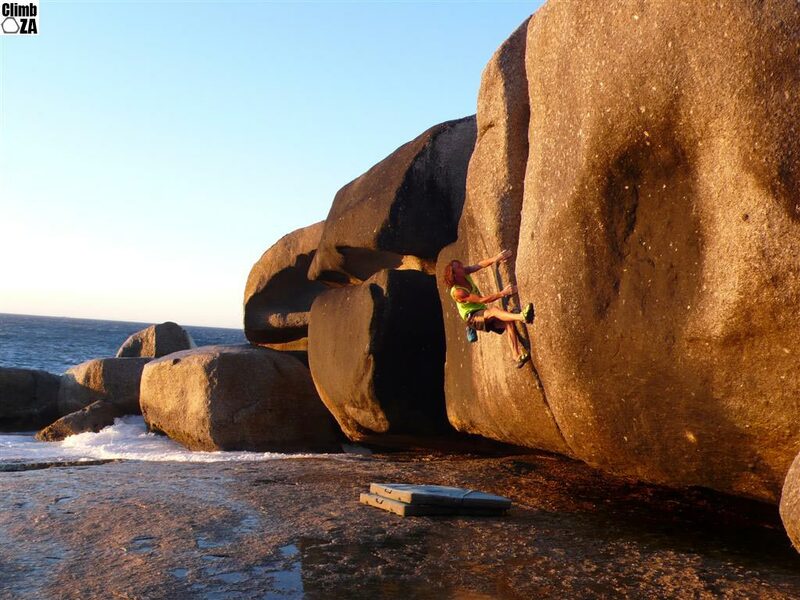 This has not always been an easy task since Llandudno has traditionally only been visited intermittently by climbers who don’t keep track of what they send. May this guide share the joy that I have found among the friendly giants of Llandudno. Very cool just in time for dec holidays! Good Job Joe shot for all the hard work. Thanks for getting it on the site Justin, and thank you Joe for all the hard work you have put in. Well hell yeah!!!!! Thanks, Joe! Much appreciated! Nice Joe!! 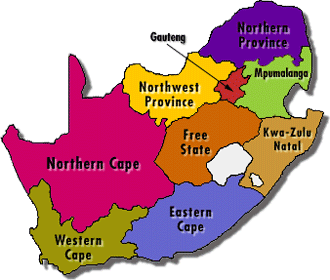 See you guys soon in PE. I just corrected the typo. At the risk of sounding a bit negative, I feel it is only fair to give out-of-towners a heads up. There is a school of thought that says that Llandudno is a very nice place and that you should not ruin it by climbing there. The rock is very low quality (it breaks) and it is sharp. Think along the lines of taking the sharpest stuff at Rocklands and then roughing it up a bit with a diamond tipped file to give it an edge that would make Jamie Oliver weep. 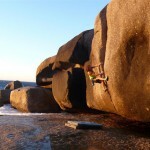 Nice boulders, thanks for developing this area, I climbed yesterday and liked!!! Perhaps I am not following your comment all the way. Are we not supposed to be climbing there? Or is this just a school of thought from somebody? Yeah, I might have broken a couple crystals accidentally by climbing there yesterday, but I probably still had less impact than the guy we saw painting on the rocks. Good first draft of the guide.. thank you very much. Is there an editable guide somewhere? Some of the maps are a bit tricky to use…. perhaps the community can assist? @Rachel: Guy’s saying that it’s not really worth the effort to climb there. 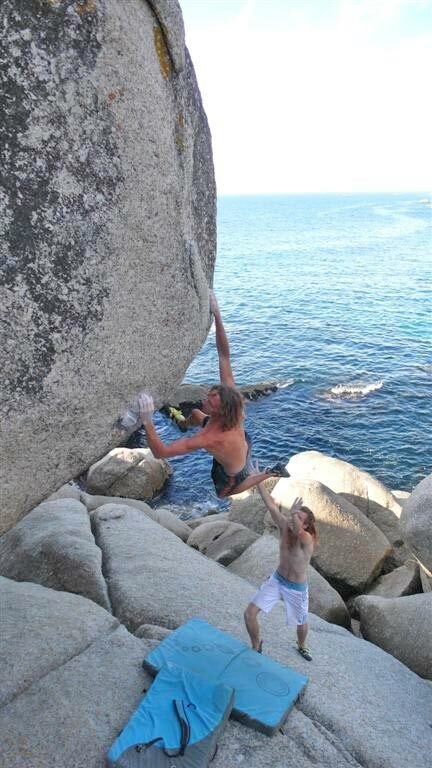 FAR better bouldering elsewhere. 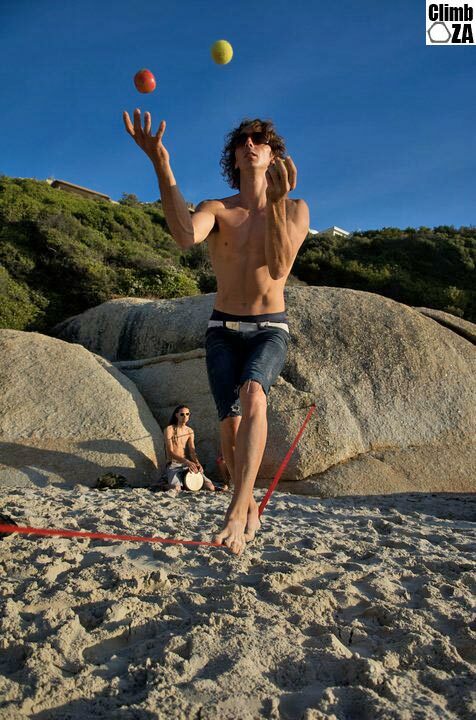 Joe lives in Hout bay, so it makes sense that he’d have spent so much time climbing there. Cool climbing though if you liked ripped finger tips. I think Guy is a bit jaded. The problems may not be the best of the best, but are still good, the location is sublime though and a nice spot for a couple of hours pottering. 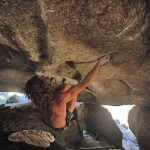 And the rock is no sharper than numerous renowned bouldering spots around the world. 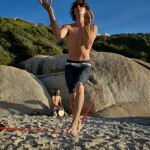 Nice work Joe, looks great; and congrats on some of the those ascents, a couple of great lines sent. if the Egg had agrade what do you think it would be? ?